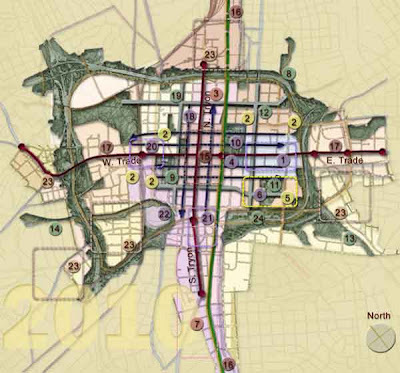 Legacy 2030 | Winston-Salem/Forsyth County Planning Board: What's Charlotte doing? Charlotte’s comprehensive plan promotes a downtown with an urban form, mixed-use development, multi-modal transportation, infill development, and higher density development at key transit corridors and activity centers. The Center City 2010 Vision Plan (adopted in 2000) also guides development in downtown Charlotte and has similarities with our own Downtown Plan. The Center City 2020 Vision Plan which is currently being developed will look at economic, destination, lifestyle, education, residential, retail and infrastructure considerations. The Plan will include recommendations for enhancing neighborhoods, corridors, districts and streets; catalyst projects to make the plan reality; and policies relating to the long-term growth of the Center City.